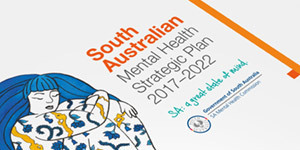 The Commission promotes mental health and wellbeing and this video anti-stigmatisation campaign is a series of seven videos featuring South Australians who live, work or socialise together and support each other through difficult times. Fear and ignorance about mental illness contributes to discrimination, making it harder for people with a mental illness to find work, a place to live, and be accepted as valued members of the community. These videos aim to change people’s perceptions about mental health issues and promote social connectedness though reaching out to seek help and/or give help. Rick Hinge and Andrew Cavill say rural blokes can be a “bit of a weird mob” who are so attuned to solving problems on their farms, they think they should be able to fix all problems. But some problems are not like fixing a fence. Artist, speaker and consultant Sarah K Reece on how diversity enriches workplaces and why we need to stop filtering out people with mental illness. Brooke and Kieren’s video looks at things that weigh on men when they are struggling with mental health issues and what role mates can play when men are struggling. Sometimes men seem to shy away from leaning on others, or do it in a different way to women. Enaam and Soha’s video is about embracing change when you come to a new country; being curious, learning about the culture you find yourself in and how building new connections can help our mental wellbeing. Zac and Sam – You’re perfectly OK the way you are –that’s the message from Zac to young transgender people. Be kind to yourself and if you want to change, that’s fine. Zac and partner Sam generously told their stories as part of the SA Mental Health Commission’s anti-stigma video campaign. Judy and Robert – sharing lives – As we age, maintaining our networks is good for our mental health and wellbeing. Judy and her friend Robert shared their stories as part of the SA Mental Health Commission’s anti-stigma video campaign. Scott and Juanita – Young musician Scott Rathman Jnr talks about the importance of cultural identity, respect and connection for good mental health. Scott and his partner Juanita shared their story as part of the SA Mental Health Commission’s anti-stigma video campaign.